The EVA1 received the major EVA 2.0 firmware update at the end of March 2018, adding All-I recording codecs, RAW output, time lapse recording, expanded lens support and more. Released in late 2017, the EF-mount EVA1 is a 5.7K cinema camera containing a Super-35mm sensor that features 14-stops of dynamic range, Dual Native ISO ratings of 800 and 2500, and the same colorimetry as the renowned VariCam camera system. 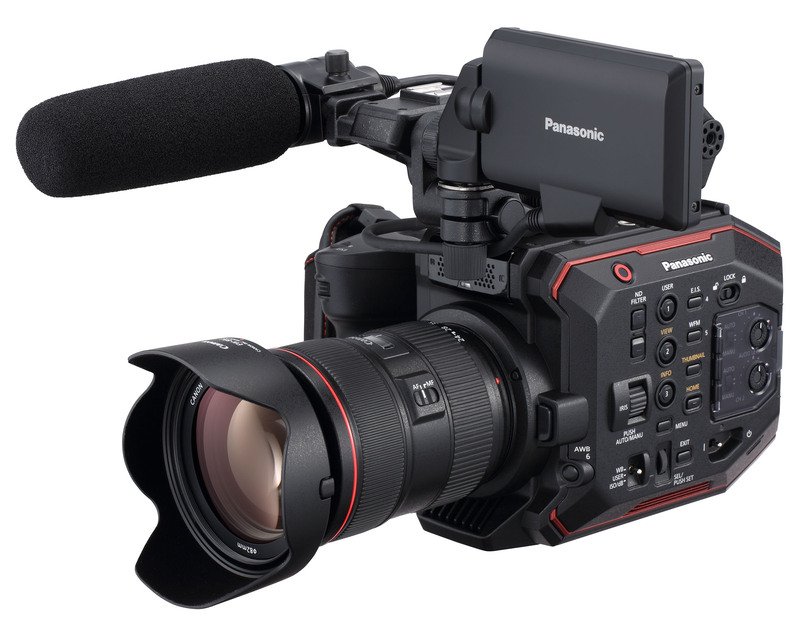 The EVA1 is being used for all sorts of productions, explained Mitch Gross, Cinema Product Manager, Panasonic System Solutions Company. While some productions prefer to shoot in VLog, do careful color grading in post and apply noise reduction to sensitive shots as necessary in the finished edit, other jobs simply do not have that post schedule available. They pick a Scene File, expose accordingly and wish to apply noise reduction in camera to avoid the time consuming steps later. While the EVA1 already features two levels of noise reduction in its menu along with an OFF position for no NR the new SMOOTH mode is a more aggressive setting designed for use with higher ISO settings. Clients indicated that they would like it available at all times so it s available in all resolutions and ISOs. One of the advantages of a 5.7K sensor is that even at ISOs such as 2500 or even 5000, with SMOOTH mode the EVA1 shows less noise and yet retains higher re solving power than competing 4K cameras. any of 27 other additional functions available in the camera s menu. On request from customers, Panasonic has adjusted two menu functions. EXPAND mode is a focus assist tool that magnifies a portion of the image. The duration the mode is engaged has always been adjustable, but by users requests the default setting automatically returns to normal viewing after ten seconds. Scene Files could always be named, but now the names are visible in the Color Setting menu page as well as the HOME screen Color Settings shortcut, making the selection of the appropriate Scene File easier. The AU-EVA1 5.7K handheld cinema camera is distinguished by a pixel count of 5720 H x 3016 V (17.25 million), Dual Native ISO ratings of 800 and 2,500, and 14-stops of dynamic range. The newly-designed EVA1 sensor is Super-35 sized (24.60mm x 12.97mm) with 5.7K resolution. With an active resolution of 5720 x 3016, the EVA1 delivers more than 17.25 million photosites, nearly double the 8.8 million for 4K DCI (4096 x 2160). Weighing only 2.65-lbs (1.2Kg, body-only) with a compact form factor (6.69 H x 5.31 W x 5.23 D) and a removable handgrip, the EVA1 can be used for efficient handheld shooting applications. Because of its compact form factor, it can also be mounted on a drone, gimbal rig or jib arm for complex yet smooth camera moves. About Panasonic Corporation of North America Newark, NJ-based Panasonic Corporation of North America is a leading technology partner to businesses, government agencies and consumers across the region. The company is the principal North American subsidiary of Osaka, Japan-based Panasonic Corporation, and leverages its strengths in immersive entertainment, sustainable energy, automated supply chains and connected mobility to provide integrated solutions for B2B customers. Panasonic was featured in Fortune Magazine s 2016 ranking of 50 companies that are changing the world and doing well by doing good. Specifically cited were its smart and sustainable technologies, including its contributions to smart cities and the electric vehicle revolution. Learn more about Panasonic’s ideas and innovations at www.PanasonicMovesUs.com.